So many different pack versions! What pack do I choose? Below are the specifications of each pack individually. 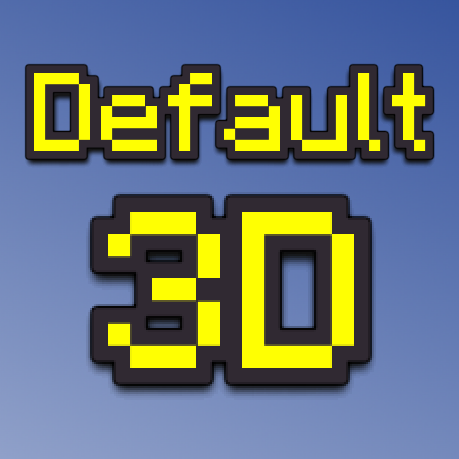 Default 3D Low would be your way to go when the computer you're using isn't that powerful. Considering it's derived from Default 3D High. In comparison, it lacks a few block models and features pack-specific block models. This ensures the pack will run smooth. Models in this pack also features 'connecting texture faces', this makes all textures of all faces of a model connect seamlessly with its adjacent faces, creating an eye-pleasing gameplay experience. Default 3D Medium is a great alternative for both Low and High, hence the word 'medium'. It features all blocks, items and textures Default 3D High does. The only difference is that some block models are altered to feature less elements. This benefits the pack's performance. It's designed for decent performing computers. Models in this pack also features 'connecting texture faces', this makes all textures of all faces of a model connect seamlessly with its adjacent faces, creating an eye-pleasing gameplay experience. Default 3D High can be considered a number one choice, granted that your computer's performance is average or above. Unaltered, it features all blocks, items and textures. Models in this pack also features 'connecting texture faces', this makes all textures of all faces of a model connect seamlessly with its adjacent faces, creating an eye-pleasing gameplay experience. Default 3D Snapshot is exactly what its name implies. It's derived from High, but features models for the newest blocks and items that are added in snapshots. Note that these snapshot models are never featured in any other pack. In case the above packs cannot function properly with newer versions of Minecraft, this pack always will. would you make one for Animals? Sadly, entities can't be altered using resource packs in the Java version of Minecraft. Is it possible to add mod support to this texture pack? It is very possible to add mod support. I've done so briefly in the 1.8 versions. Though, I'm not planning on spending time supporting content made by third parties that may or may not (in a timely fashion) update through future versions of Minecraft. While only being utilised by a small portion of this pack's userbase. I'd rather spend time adding content for everybody to utilize and enjoy.